If you walk in to the Henn-na (or the Weird Hotel) in Japan, you will likely be met by two receptionists. Both speak English but neither is like any receptionist you've ever seen before. One appears to be a perfectly airbrushed woman. The other is a dinosaur. Both are robots. The concierge at Henn-na is also a robot, as is the porter. While the Weird Hotel may be just that--weird--robots are still showing up in hotels, cruise ships and airports around the world in a quest to better serve travelers. The Aloft, Residence Inn and Holiday Inn hotels in California use robots to deliver room service. Costa Cruise Lines' Pepper the robot assists passengers and is trilingual in German, Italian and English. Royal Caribbean's Quantum of the Seas has a Bionic Bar with robot bartenders. KLM's "Spencer" robot takes care of customer service at Amsterdam Airport Schiphol. The upscale Nihonbashi department store in Tokyo has even jumped on the bandwagon, unveiling humanoid ChihiraAico as their consierge. 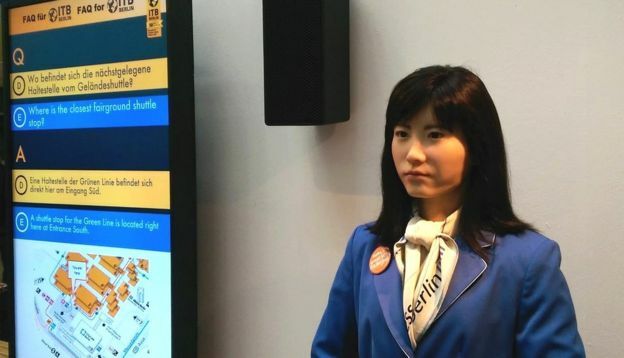 The list of robots in the travel industry continues to grow and on March 11, Toshiba unveiled Chihira Kanae, its most advanced, human-looking robot, at ITB Berlin, the world's largest tourism convention. The idea that robots will be at the front desk or even helping you with your luggage on your next vacation is not so far-fetched. In fact, According to a global survey by Travelzoo, (NASDAQ: TZOO), a global media commerce company, 80% of travelers expect robots on their vacations by 2020 and almost two-thirds said they are comfortable being served by robots in some capacity. Chinese, Brazilian and American travelers are the most positive about how robotics and artificial intelligence can enhance travel in general - 92% of Chinese and 73% of Brazilians and 71% of Americans said they were comfortable with this idea. Other nations appear more cautious. Only 37% of Germans and 47% of French respondents said they were comfortable with cyborg hospitality. 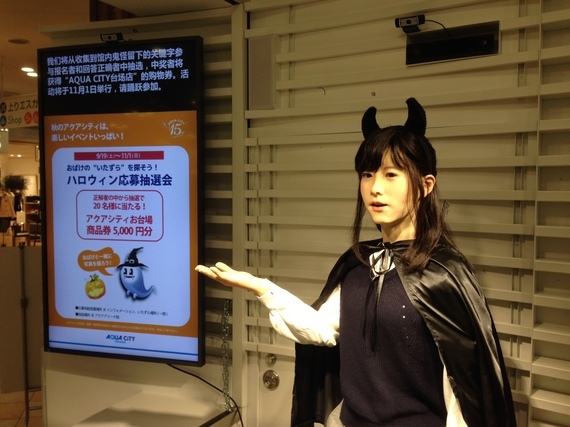 Toshiba's ChihiraJunco welcoming tourists at AQUA CiTY ODAIBA, Tokyo Waterfront City. The main advantages travelers see in robots are related to general efficiency, data retention and recall. More than three-quarters of respondents think that robots would be better than humans at handling data (81%) and dealing with different languages (79%), while 76% believe robots have better memory overall. And 81% of respondents cited their untiring energy as an advantage. But that doesn't mean that respondents don't have their concerns. 75% said robots are impersonal. 70% doubted they would be able to understand informal language such as slang, idioms, local dialects or irony. 75% worried that their bionic counterparts would eventually take away jobs. Commenting on the survey's findings, Travelzoo's European President, Richard Singer said, "Right now is a very exciting moment in the history of the travel industry - groundbreaking technology is revolutionizing what is possible from the perspective of customer service, entertainment and personalization. Robots and artificial intelligence are making their debut on the tourism stage, and our research into global acceptance of robots working in the travel industry is largely positive. Most nations are starting to open up to the idea of robots in travel and see the tangible benefits heading our way in the very near future." Andrea Chrysanthou is an editor of the Travelzoo blog and is based in Toronto, Ontario. Travelzoo has 250 deal experts around the world who rigorously research, evaluate and test thousands of deals to find those with true value.